Can you believe it’s just 4 days until Christmas? Are you ready? I am most certainly not. I’ve bought all my gifts, but I haven’t wrapped a single one. My mom and I haven’t even talked about what we are serving this year for Christmas, and The Carpenter and I have yet to discuss plans. If you are behind, I hope this makes you feel better. It makes me a little panicky. The original recipe called for making a caramel topping, and while I think that would be delicious, it kind of seemed like a pain, given all the other things I’ve frosted, and still plan to frost this year. I’m sure that caramel sauce or some sort of chocolate ganache would be delicious. I imagine you could even dip these in melted regular or white chocolate. 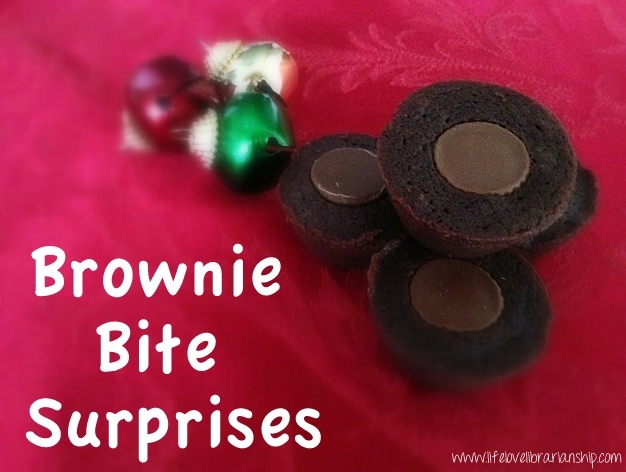 Some sort of topping would also cover up the “surprise” bit of the brownie bites. I liked the way mine turned out so it really didn’t bother me that it wasn’t so much a surprise. But if it does you, then by all means, pile on some frosting, caramel, ganache, melted chocolate, whatever floats your boat. Clearly, from the picture, you can tell that the surprise is a piece of candy. 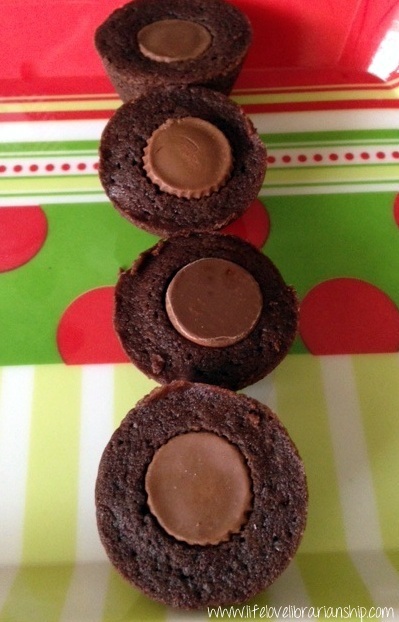 I used a mix of mini Reese Cups, Hershey’s kisses, and Rolos, but you can use mini Snickers or Milky Way bars too. It’s very important that you freeze the candy so that it holds it’s shape in the oven. Don’t skip that step. Can you hide the candy bar? I suppose you could put a little brownie batter in the pan, add the candy, and then top with more batter. That seems awfully time consuming, but if the appearance of the brownie is important to you, try it and see. And then let me know how it turned out. Put chocolate and butter in a microwave-safe bowl. Microwave for 2 minutes on medium power, stir, and continue heating on medium power in 15 second intervals until butter is melted. Stir to melt any remaining chocolate. Set aside to cool for a few minutes. Preheat oven to 350°. Grease 2 (12 muffin each) mini muffin tins well. Add sugar to melted chocolate and stir. Add beaten eggs, vanilla, and salt and mix until well combined. Gradually stir in flour. Batter will be thick. Spoon batter evenly into prepared pans, filling about 3/4 way full. Lightly press a mini candy bar into each brownie bite. Bake for 9-10 minutes, until edges look set. Allow to cool completely on a wire rack before removing from pan. *Out of unsweetened chocolate? Use 3 tablespoons unsweetened cocoa powder and 1 tablespoon butter or shortening to replace 1 oz of chocolate. If you do this with this recipe, you’ll need 6 tablespoons cocoa and 8 tablespoons (1 stick) of butter total. Put the cocoa and butter in a bowl and melt as directed. These look really good, but I don’t think I will be making them in the next week or so. I’m a little full (over full) of fudge and other Christmas goodies. The recipe looks fairly simple, but I can also see using a brownie mix I got on sale. Thanks for the tip about freezing the candy.